‘Uncontacted Indians? !’ — contact an anthropologist! The Courier-Mail here in Australia has just posted a story, Indian tribe discovered in Brazil, prompting (so far) two reporters to call me. Before I made too many statements on the radio, I thought I’d track down the original source for this report, as I found it improbable at best. So, after tracking down several variants, following it through Survival International’s website, I got to the original report from the Fundação Nacional do Índio (FUNAI, warning: Portuguese website), who I trust more than the Courier-Mail or the UK Daily Mail‘s version (here). The apparent aggression shown by these people is quite understandable. For they are members of one of Earth’s last uncontacted tribes, who live in the Envira region in the thick rainforest along the Brazilian-Peruvian frontier. Thought never to have had any contact with the outside world, everything about these people is, and hopefully will remain, a mystery. Another photo caption reads, ‘The tribespeople are likely to think the plane that took this photgraph is a spirit or large bird.’ And Hanlon waxes philosophical: ‘It is extraordinary to think that, in 2008, there remain about a hundred groups of people, scattered over the Earth, who know nothing of our world and we nothing of theirs, save a handful of brief encounters (emphasis added).’ Hanlon explains well enough why these groups might not want to be contacted: problems with loggers in Peru, miners, cattle ranchers, petroleum drilling, and ‘diseases like the common cold to which they have no resistance’ (the cold?!). While I certainly agree that small pockets of cultural diversity should not be aggressively assimilated, I feel a little queasy that we have to sell the drive for cultural autonomy and respect for foraging peoples with the whole ‘never seen a white man’ drivel. The term ‘uncontacted’ is part of the problem; ‘isolated’ would be better, as these groups have seldom ‘never seen a white man.’ They usually have developed a habit of reacting hostilely when they do, perhaps suggesting that it’s not so much lack of contact, but certain kinds of contact that they have experienced. The FUNAI website, for example, is very clear that four isolated groups living in the region in which the aerial photographs were taken in late April and early May have been observed for twenty years, and the FUNAI site focuses on the news that the groups appear to be reasonably healthy (which is news). They put the photographs up with the statement that they are for ‘cultural dissemination’; unfortunately, in the case of the Daily Mail, this includes over-excited tabloid captions (predictable, but lamentable). The Portuguese-language website describes how the ‘Front for the Protection of the Ethno-Environment’ of FUNAI is responsible for protecting isolated Native Americans and their lands. According to the Coordinator-General of Isolated Indians, Elias Biggio, the ‘Front’ does not make contact with the groups, ‘which require intensive actions on their behalf to counteract incursions [by miners, loggers, and others], allowing in this way the isolated indigenous peoples total autonomy.’ In other words, far from being ‘never contacted,’ the Brazilian government works damn hard to keep these groups, usually remnant fragments of once-larger groups, safe from outsiders who constantly threaten their territory and health. In fact, FUNAI has documented, according to their website, 69 isolated indigenous groups in eight states (most in the Amazon), that they seek to protect. The task is made significantly more difficult by the fact that they are spread over some very remote, rough terrain; 15 million hectares (45 million acres) according to FUNAI. The groups are pretty small; only a handful have more than 400 people. One of the reasons these groups are attracting attention is that they are under pressure, especially on the Peruvian side of the border, not only from the usual suspects (miners, loggers, and ranchers), but also from a French petroleum company that wants to drill in the area. Why can’t we go with that story: protecting the environment, wildlife, and the local people’s ways of life against the shattering impact of wreckless resource extraction to feed petroleum addiction? Why do we have to stoop to the whole ‘they think the plane is a giant bird or spirit’ and ‘their way of life was unchanged for 10,000 years’ cannard? One can even see the ‘lost tribe frozen in time’ theme grow more and more pronounced as the story filters through from FUNAI to Survival International to the Daily Mail story, ‘Incredible pictures of one of Earth’s last uncontacted tribes firing bows and arrows,’ to the questions asked of me by reporters. So now I’m going to go on drive-time radio and try to straighten this one out, swimming upstream against the ‘lost tribe’ excitement. Fortunately, it’s the Australian ABC, so I’ve at least got a fighting chance that they’ll not edit out everything I say. This story seems to be getting a lot of coverage. I imagine phones have been running hot in anthropology departments around the world. Both The Australian and The Sydney Morning Herald report on the “lost tribe” having been spotted. I wonder if the members of the tribe knew they were lost. It was really very careless of them. Why does one tribal member appear to be completely black while the others seem to be more of a red? Aren’t “tribes” usually composed of members with the same genetic history? This story is one of the top read stories on cnn.com. So, it seems it will only get worse for anthropologists. Thanks for clearing it up, however. It’s really irritating to have to dig to get to the bottom of the “news.” A necessary evil. Following up on Jovan’s remark, I noticed an apparent contradiction here between ‘the understandable aggression’ on display and the notion that these folks are among the ‘last uncontacted’ tribes. 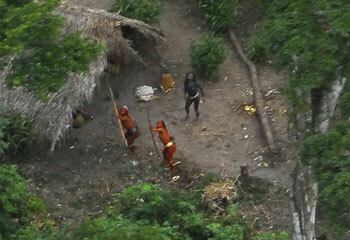 The implication seems to be that their aggression somehow relates to their being the ‘last’ remaining uncontacted people — that they are fighting to remain this way with some sort of reflexive awareness, which wouldn’t make sense if they actually were putatively ‘uncontacted.’ The Western media sees these people in temporal and spatial isolation amidst a sea of jungle, but if we remember our early readings in political anthropology, including for example Clastres’ interesting theses, we might imagine a quite different circumstance in which these folks have a history of relations with others. I do think the interesting story here is why people in the Western world (this is a big story here in Finland too) find this myth so very appealing. My question is: _Why_ do people (tabloid publics, say) find this story so interesting, so pleasurable, so tantalizing? A bit of an update: The interview went especially well with ABC Radio in Melbourne, and it was during ‘drive time,’ so presumably some number of people >10 probably heard it. The whole story is fascinating, but I’m still troubled by the way that various publications are simply reproducing the version that seems to have been hatched at the Daily Mail, that bastion of level-headed social analysis, in conjunction with spokespeople from Survival International who seem to have lost the plot. The insertions by the reporter into the version of the story from FUNAI in Brazil are liberal and egregiously stereotypic. Sometimes I think anthropologists can come across as professional worriers, chronic cultural doomsayers and knee-jerk self critics, but this particular case of pop culture does seem to be a big fat problem, especially as it completely distracts from the really important work that organizations like FUNAI and Survival International, with all of their problems, are trying to do to help groups who choose not to integrate into national society in places like Brazil and Peru, especially as integration seems to hold little promise but abject poverty and misery with virtually no autonomy. The radio host from Melbourne seemed to have been hipped to my skepticism by her producer, so she pitched me some nice softball questions — she was really ready to turn conventional understandings on their heads. One thing that she brought up, though, or maybe it was me, was that there’s this idea that it is ‘inevitable’ through ‘progress’ that people like this will have to disappear. But that’s no more ‘inevitable’ than the idea that ‘progress’ will necessarily wipe out whales, destroy the rainforests, poison us all with cancer, or wreck the planet. I wonder if all those ‘well, it’s sad but that’s the inevitable cost of progress’ really even think for thirty seconds about what they’re saying: are they saying that every acre of land that might support people who want to hunt or gather food, inevitably, must be drilled, logged, burned, or dug up for minerals? Really? The other thing that people focus on, as Strong points out, is their ‘aggression.’ Of course, these groups have typically been subject to stunning aggression — they are usually familiar with Western bullets and other tools used against them. The fact that they fire arrows at planes is hardly a sign of their ‘natural’ state. I was reminded of the fact that, if you flew a plane low over certain parts of Queensland, or Appalachia, or Idaho, you’d be LUCKY if you had only arrows shot at you. These people want to be left alone, and it should hardly be surprising that they might take a shot at planes flying low (hmmmm… I wonder if prospectors or logging companies have ever flown Cesnas over the area before…). Finally, Jovan brings up the ‘lost’ angle, and he’s right — those nutty Indians are just getting lost too often. As the FUNAI site makes clear, they have been following these groups for years and have a pretty good idea how many there are and where they are. But one reason they keep moving is not because they get ‘lost,’ it’s because they’re hiding. The bottom line is that the groups are not ‘uncontacted’; they are isolated, they have generally not been well studied (often because they don’t want to be), and they distance themselves from the mechanisms of the state (which are already pretty flimsy out in these areas of Brazil and Peru). They’ve got every reason in the world to avoid the violent edge of Western societies, and plenty of dreadful experience with ‘white people’ (even if they’re actually of many colours). I couldn’t help but think of how other groups that seek to withdraw from the world (religious groups, communes, survivalists, dissertation-writing doctoral students) might respond to being studied from the air, and I just have a lot more sympathy to their hostility. I don’t know why it’s so fascinating to Westerners though: is it just a wanting to be ‘first’ (first to make contact)? Is it a weird kind of self-loathing interest in what we haven’t already ‘contaminated’? Is it a kind of wonderment that people can ‘live simple lives,’ without capitalist materialism and convenience technology, like we see around the Amish and others? Is it an assumption that ‘uncontacted people’ might show us our ‘true selves’? Likely, it’s part of a tangle of conflicted and ambivalent thoughts — fascination and yet conviction that they will end tragically, wonder at their simplicity and yet inability to simplify our own lives, exotophilia and fear of the unknown. Isn’t it usually the case that we’re most fascinated with the things that perplex us? Thanks especially to Strong for passing on the thoughts. JUST DONT TOUCH THIS TRIBE AND LEAVE THEM ALONE. THEY DONT NEED TO HEAR ABOUT RELIGION AND OUR SO CALLED MODERN CULTURE. LEAVE THEM ALONE. Most interesting. When working in Laos, I once visited a village where most of the children “had never seen a white man before”. Older villagers told me that the last time a white man was seen in the village area was in the 70s (ie. during the Vietnam war). Of course, this does not mean that these villagers had no contact with “the outside”. To the contrary, lots of labour migration was going on. Yet, the statement that some of the children had “never seen a white man” was in this context in a sense true. It is a short step from this to assumptions about “isolated tribes”. I read somewhere that the former head of Survival International now heads a pro-fox hunting group in England. The logic would certainly be consistent. Why can’t we go with that story: protecting the environment, wildlife, and the local people’s ways of life against the shattering impact of wreckless resource extraction to feed petroleum addiction? Why do we have to stoop to the whole ‘they think the plane is a giant bird or spirit’ and ‘their way of life was unchanged for 10,000 years’ cannard? I wonder if you haven’t begun (probably intentionally) to answer the question? Faced with a choice between the extraction, export, and sale of our most precious and rapidly exhausting commodity – oil – and the preservation of an ethno-environment (I like that term, thanks FUNAI), the people who read the newspapers quoted will feel torn. I think it is also worth thinking about the fact that a group may have a long history of interaction with other groups and then a long period of isolation. In the context of the Eastern Woodlands I think the Seminole are the textbook case. I lived in Guatemala during the last couple of years of the civil war there and at the time there were communities purposefully removed from interaction with mainstream Guatemalan society in order to escape military repression. They were certainly skittish about contact with outsiders but they were hardly uncontacted. (Anyone interested in free African/African diaspora communities in the Americas can recognize what was going on there.) Outside of the Americas I think North Korea would fit into this broad category. I think an interesting research question us whether these two proposed kinds of isolation—the pre-contact as opposed to the post-contact—are qualitatively different. For example, while most contemporary North Koreans have never seen a whiteman it certainly seems possible that they have a living family member that was shipped out of the country during the war as a laborer. I would expect that such a person would have a different view of the world than would his/her grandchild that had only known life in the DPRK. be, due to historical context, categorically distinct. Call me naïve but I did find the Daily Mail piece quite surprising. I guess I was caught off-guard. Sure, I’ve heard some similar things about “uncontacted groups,” said by diverse people (including university professors). But I guess I never realized how far these ideas would go, in people’s heads. Hanlon is probably a very decent person but I have a very hard time wrapping my head around his writing. Especially since he presumably had some “contacts” with Meirelles. Another thing I find surprising is that, while there are active discussions on some anthro blogs and elsewhere, there’s only one comment on the Daily Mail piece. As I had been “isolated” from the whole debacle, I was assuming it was a new piece, not one from May 29. Maybe they moderate out comments they don’t like, on the Daily Mail site. Im not a firm follower of the people that “THINK” we need to go and vacinate thi stribe and all others to protect them from the outside world……well if they have been around for all this time without contact and wish to not have any, then we should leave them alone. Trying to convert them into a “Modern Tribe” shuldnt be a part of the plan either….if first contact with the outside world has a %50 chance of illness and death, stay out of the region they live in and let these people be. -they are my new sustainability heros. -the dark person’s skin may be dyed? in mourning? shaman? -the big, older hut is communal/ceremonial? Though groups who have not had direct contact with outsiders may exist in the Amazon, this group is not one of them. The existance of the tribe has been known since the 1930s and the “discovers” simply used a map and a chartered helicopter to overfly their village. Yes, I think that’s exactly the sort of point that Greg was making. Our melanesian youth group is seeking for postgraduate research students and fellow researchers who have melaensian research interest to work with. Should any intending research interest for melanesian, we have many interesting research topics on melanesian anthropological and archeiological studies. Visit our blog at: http://melanesianway.blogspot.com/ and let us know and we are very willing to work with you and assist in your research. Members of our group who are fieldworkers are very willing to assist researchers as a way to preserve and record our fading malanesian cultures and way of life. anthro.pophago.us snippets of media, anthropology, design, culture and politics. Rechtfertigt der gute Zweck einen "menschlichen Zoo"?